Acoustic guitars and the voice of Timo are what you get on Te amaré. Timo Kotipelto sounds here vulnerable and you can hear him suffering. Can't remember that I ever heard him that fragile / emotional before. But partly his voice is still powerful, not whining as so many others. The single shortens the time til the new album will hit the stores and it also shows Timo a bit differently. Well done. 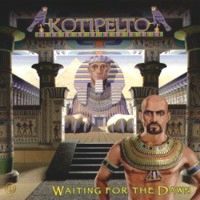 This is the first solo work of Stratovarius singer Timo Kotipelto and a conceptual album! The lyrics deal with the ancient Egyptian history and mythology, but the protagonist is a fictive person. The historical background Kotipelto has from his days in school when he even thought about studying history! Musically Waiting For The Dawn is offering everything from heavy rock to melodic power metal. Songs like Arise remember of Black Sabbath (Tony Martin era) and Testimony and Chosen By Me remind me of Iron Maiden (Powerslave-era). But that ain't describe the whole musical aspect of this album! Lord Of Eternity for example is a more complex track, with progressive elements... Like Stratovarius meets Symphony X.... While Knowledge Of Wisdom is a track which could have been on the latest Stratovarius album, in my opinion. Now you know about the music and the lyrics, but might wonder who joined Timo Kotipelto in the studio... For the recordings Mr. Kotipelto got joined by: Bass player Jari Kainulainen (Stratovarius), guitarists Mike Romeo (Symphony X), Roland Grapow (ex-Helloween) and Sami Virtanen (Warmen) as well as keyboarders Janne Wirman (Children Of Bodom, Warmen) and Mikko Harkin (Sonata Arctica) and last, but not least on drums Gus from HIM and Mirka Rantanen (Tunnel Vision, Warmen)! Some he ask for a helping hand, others heard about this solo album and called to ask, if they are welcome! Btw, the cover is done by Derek Riggs known for his work with Iron Maiden! Resume: A great album, a fantastic debut and not easy to top! Stratovarius front man Timo Kotipelto is now releasing his first solo album. What I think about this solo albums and side-projects I told in the review of Full Strike, so this time I'll concentrate on the music.